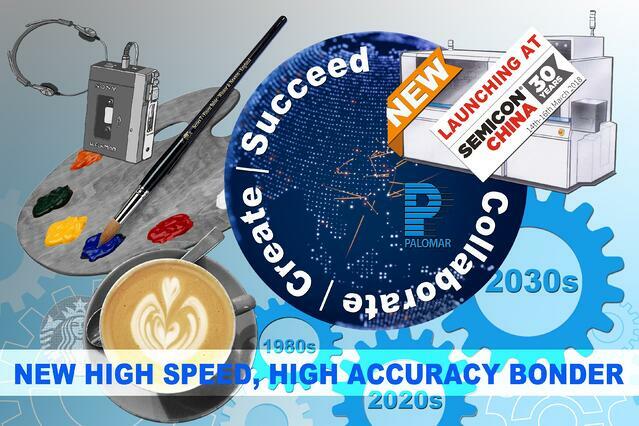 Our latest blog interrupts the series on Current Trends in the Opto-micro-electronic and RF Packaging Eco-systems to bring readers important news on Palomar’s exciting new addition to its 3880 Bonder family, the 6532HP, which is being launched at SemiCon, Shanghai, China, the week of March 14, 2018. We hope to see some of you there. (The views represented are entirely those of Dr. Anthony O’Sullivan Palomar Technologies Strategic Market Research Specialist. Dr O’Sullivan will gladly field questions and comments). As a British student enrolled at an American University in the 1980s, two memories stand out in reflection these many years later. The first concerns coffee, or rather the fact that America had yet to discover it, by which I mean “real” coffee. Those of us “in the know” would refer to the US beverage as “factory sweepings”. With great sympathy, and with little regard to the cost of postage, my parents sent regular supplies of Italian coffee—each packet dedicated to those of us who knew the difference. Little did I know it then, but at exactly the same time a man called Howard Schultz from Seattle was visiting Italy and started doing something similar. That was the beginnings of what we know as today’s Starbucks. If only I had known the potential!! My second discovery that year concerned paint brushes. Apparently, the British make some of the world’s finest. Not any kind of paint brush, mind you, but the kind used by artists. As a result, other than enjoying my coffee, my artists friends had my parents send over brushes of various kinds. As a result I learned a lot about art, brushes, canvas types, and materials. I certainly learned that a Winsor-Newton is not just a brush. Some years later I came to appreciate that artists, artist materials, bonders and engineers, actually have a lot in common: They come in a large variety of types and expertise, ranging from those best fitted to work in broad strokes, on large scale projects that everyone can see, to the more finely attuned, applying carefully composed materials to small areas, painstaking but yielding extraordinary results. It says a great deal that the core principles in both cases are equally timeless. To achieve the very best results there must be strong qualitative alignment between the materials and tools used, which in turn must be identified, designed, chosen and applied with the sharpest and most expert of eyes, if the desired result is to be attained. Unlike in the world of art, however, where the techniques and materials historically used to create some of the most vivid and extraordinary artistic achievements have been lost to the years, the variety of materials and the techniques used in the world of opto-electronic micro and RF packaging have never been more profuse in number, nor have the demands placed upon the tools needed for their application been more exacting, or demanding. If these factors were not challenging enough, we must add the requirements of agility, flexibility and adaptability demanded by rapidly evolving environments, trends reinforced by ever-more sophisticated and discerning markets. As in Art, such demands could be a chore too daunting—where it not for the determination of what exceptionalism can achieve. Further more, today’s “artist” must have a far wider peripheral engagement than ever, not least awareness of rapidly approaching points of convergence, touching the core of RF GaN, Opto-transceivers, 5G, and associated technologies. Success in today’s bonding world requires machines born of such a spirit. Just as brush, artist and materials must attain perfect synergy to create a masterpiece, so we at Palomar launch our newest Die Bonder, the 6532HP. Not only it is the perfect “brush” to fashion, create and serve the current generation of engineers (and corporate global players they engage with) but it also anticipates the requirements of tomorrow’s opto-electronic and RF technologies. We at Palomar are acutely aware of the need for machines that can meet the most exacting tolerances. That having been acknowledged, the most acute requirements are far deeper. Accuracy must be accompanied by consistency, speed, capacity, and quality, which in turn provides the peace of mind that comes from the assurance that the end result more than justifies customers’ time, trust and commitment. The 6532HP builds on Palomar’s proven 1.5 micron ultra-high accuracy capability by joining it with unparalleled speed and efficiency: melding a 1200 unit per hour (UPH) production capacity and with a dramatically lower MTBA (mean time between assists). This breakthrough is achieved using a high-speed bi-directional 6-tool turret and continuous bonding automation technology. Wafer Presentation, Epoxy Dispensing and Stamping, Flip Chip and Eutectic processes are all available on this platform. We believe it to be the most cost-effective-per-device machine available. The 6532HP is ideal for QSFP, SFP, CFP2 packaging, VCSEL modules and P-side down laser diodes. Equally, any scalable high-accuracy die attach requirement, MEMS, Ultra-fine pitch hybrid assemblies or flip chip applications. All find an excellent solution with this platform. As for price, the new 6532HP offers quality and excellent value proportionate to the investment, when considered as cost per unit produced, rather like the Winsor-Newton paintbrush. The latter, which retails between $300 and $1000 dollars per brush, is gram for gram, actually a lot more expensive than Palomar’s new bonder, but in the unbiased view of the author, is more than worthy of the artists money! Rather like our new bonder.